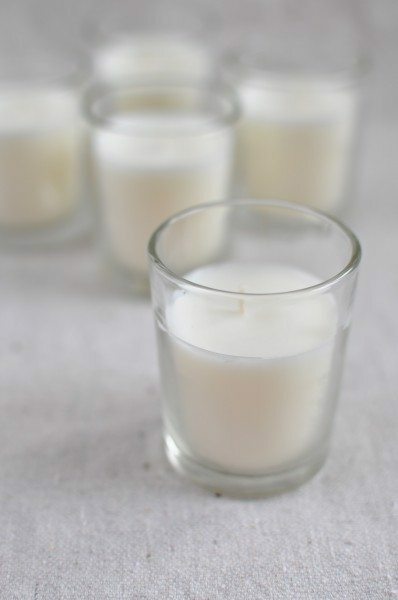 Learn how to make scented soy candles at home in just 15 minutes. For my Birthday one year, strange one that I am, I asked for some wax and wicks to make my own candles . I was very excited to receive them but actually forgot about it until a few weeks ago. Spurred on by the excitement of finding a use for my jar collection, one rainy Saturday afternoon I did a bit of Googling of how to make scented soy candles then got straight to candle making. It was pretty straightforward – melt, pour, leave to set, but what I didn’t realise was that soy wax is a lot easier to work with than parafin wax, which I’d asked for. It made nice candles but soy wax makes them a much prettier white colour. Disclaimer: I wrote this post before I knew about the potentially harmful health effects of artificial fragrances. These days if I were to make candles I would use bees wax (you can purchase beeswax melts just like soy melts) and non-flammable 100% pure essential oils. I remembered pinning Inquiring Chef’s tutorial on how to make scented soy candles a little while ago and after a bit of research, I placed an order at Natural Candle supplies and patiently waited for my wax and scents to arrive. Then I saw the Young House Love Winter Pinterest Challenge. It’s not sponsored by Pinterest but a group of bloggers issue a challenge to anyone who wants to accept, to recreate something they ‘pinned’ with their own spin. 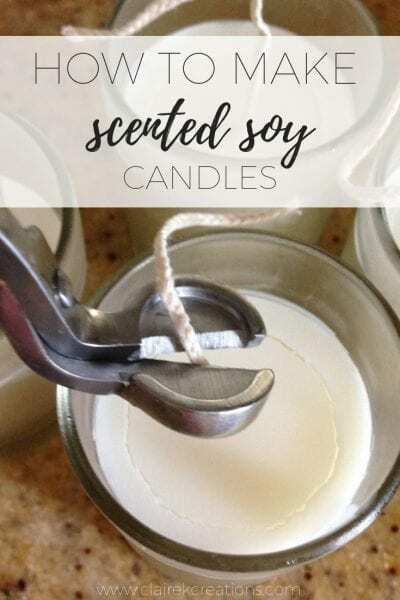 My challenge was set – make my own soy candles . I doubled the challenge and started with seriously dead little glass votives that I have had sitting in a drawer looking like this for years. I never knew it was an easy task to clean them up like new but after reading this tutorial that I found via Pinterest, I was in the know. The first step is to fill them with boiling water. When I told mum about this after I’d done it, she warned that the glass can break if you pour the water straight into the glass jars . Maybe heating them a little in some warm water would prevent this but mine didn’t break. You leave the water to cool and the wax should lift to the top of the water. Some of mine stayed at the bottom but a little nudge with a fork and they popped right out. To get rid of the black soot marks I just gave them a little scrub with dishwashing liquid and warm water and they were as good as new. I seriously can’t believe I didn’t do this sooner. They were destined for the bin in my mind. Now come the technical parts. You don’t have to re-use old candles, you can use whatever you like – old jars, a little pot, tea cups – anything that you could microwave safely I’d say would be fine. First up you have to add the wicks . 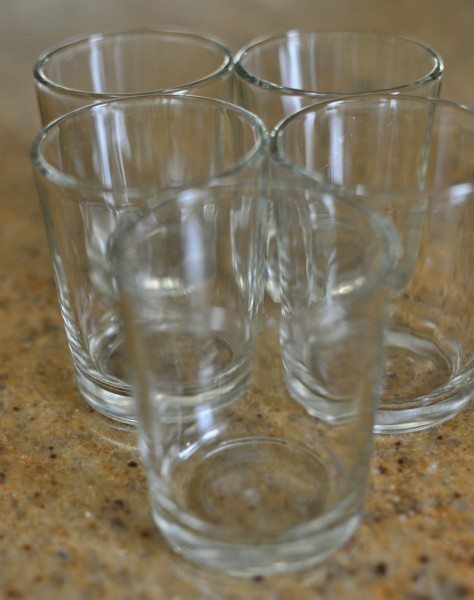 Measure out the height just by holding it next to your container then add a few centimeters on the bottom and top. To attach the wicks at the bottom I was very professional. I used sticky tape. Just fold it around itself to make it double sided then secure it to the bottom of the jar. Use a skewer to press the wicks down and stick it to the bottom. You can get fancy little things to hold it there but sticky tape works so I’m not wasting money on something else. A word of warning though – don’t try using a hot glue gun. 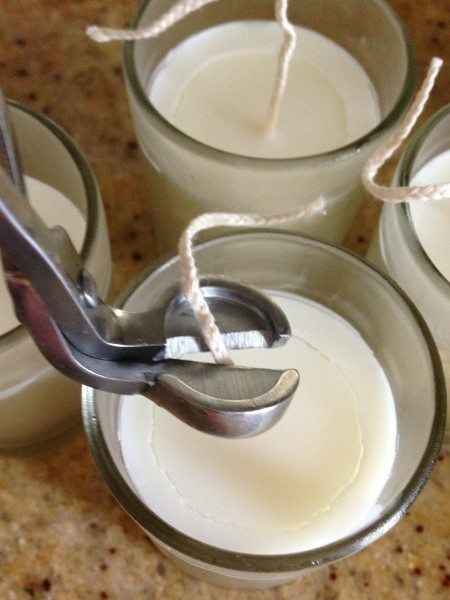 The glue will melt when you add the hot wax and the wick will float up from the bottom (yes I’m telling you this from experience). Once it’s attached to the bottom you will need something to hold with wick taut and centered. You can wrap it around a skewer. My bag clips were the perfect size to fit over the jars so I used them. For the wax, you’ll need to work out the capacity of your jars then use double the amount of flakes. For example, if you jars hold 1 cup of liquid then you will need to measure out 2 cups of wax flakes . Pour them into a heat-proof jug and then microwave for 1 minute. Take them out, give them a stir and microwave again for 1 minute and stir. If they’re not melted then continue the microwave-stir 20 seconds a time until all the flakes have melted. Make sure you use an oven glove to take the jug out because it gets mighty hot – safety first! If you want to add a scent to your candles now is the time. You can buy special essential oils made especially for candles and they’ll work much better than normal oils (again trust me on that one). This time I went with classic French vanilla. Make sure you use rubber gloves when adding the oil. I’m not sure why but it says avoid contact with skin so I though it was better to be safe than sorry. Once you’ve stirred in your fragrance, pour the wax into your containers then leave them to set for at least 12 hours. You will notice that some of mine have little cracks. That is because I wanted them to set quickly so I could write this post. I popped them in the fridge when they were nowhere near set so I’m guessing the bits around the outside set first then the inside sank a little as it set. The moral of the story – be patient. Mum and I were out Birthday shopping yesterday, while the candles were in the fridge and what did we find? Wick trimmers ! I think it was meant to be. After I’d been telling mum all about my candle making she very kindly bought me a pair. If you don’t have any, you can just use scissors to cut the wick down. Then it’s time to marvel at your perfect little creation. I was marvelling even more after an afternoon of shopping. I saw a candle nearly exactly the same as this for $19 in one store and in others, bigger versions were selling for more than $50. I’m thinking maybe I should go into business. They make a lovely gift especially considering you can tailor the container and ‘flavour’ to suit the person you’re giving them to. Happy candle making! What about you? What would you make a candle in and what’s your favourite candle scent? 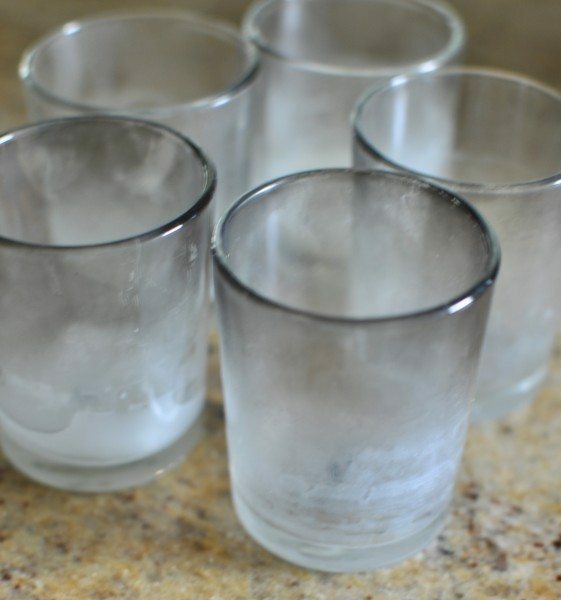 If you are using old candles, pour the boiling water into the old containers and leave to cool. Remove the wax floating on the top. Use dishwashing liquid and hot water to clean up any excess wax or soot. Cut small pieces of sticky tape and fold to make double-sided tape then place in the middle of the bottom of each jar. Cut the wicks so that about 4cm comes out the top of the jar. 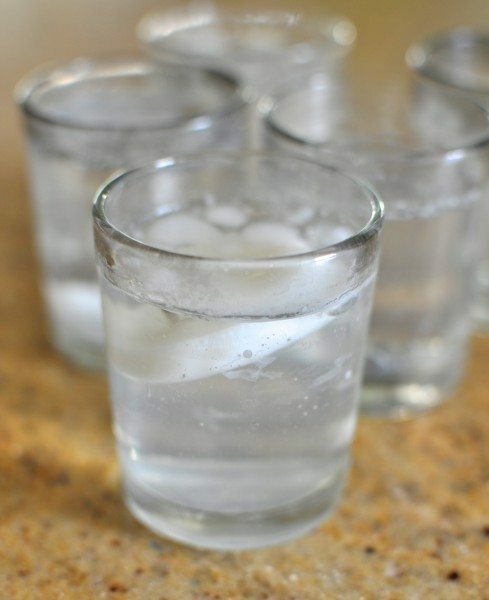 Use a skewer to press them into the sticky tape so they stick to the bottom. Place a skewer over the top and wrap the wick to hold it up in the middle. Measure out the soy wax flakes (you will need double the amount - eg if your candle is 1 cup capacity, you will need 2 cups of soy wax flakes). Place the flakes in a heat-proof jug and microwave for 1 minutes. Remove and stir then microwave for 1 minute again then stir. If there are still solid flakes, microwave for 20 seconds at a time until dissolved. Add the fragrance oil, stir and then pour the wax into the jars. Make sure the the wicks are in the centre then leave the wax to set for 12 hours. Trim the wicks to 1 inch. Measure out the soy wax flakes (you will need double the amount – eg if your candle is 1 cup capacity, you will need 2 cups of soy wax flakes). Thanks for the step-by-step, Claire, however I wanted to make a pretty important distinction that what you referenced as “essential oils” are in fact fragrance oils- a totally different beast onto itself. Yes, some think that fragrance oils are easier to handle when candle making and are definitely far easier on the wallet, but they are synthetically derived, so if you health conscious and would like to use the candles as aromatherapy, then plant-derived essential oils are the way to go, along with soy not paraffin wax, then you don’t have to worry about breathing in the carcinogens are they are evaporating into the air. Obviously this is more of a concern for indoor use or around kids or asthma sufferers. SO there’s my 2 cents, health and safety related. Hope it’s useful! *Obviously, different concentrations have to be used when incorporating essential rather than fragrance oils. Thanks so much Xenia. I have been learning about essential oils recently. They have some amazing health benefits. Yes you definitely could do that Cindy. Good idea! Hi if I have 230g of soy wax how much fragrance do I need to add for strongest scent please. Hi Hannah. This is a bit of a how long is a piece of string question I’m afraid. It depends on the scents and how strong strong is for you. There should be a guide that came with your fragrance? Hi, can we still receive replies on this thread? Hi, your tutorial is great! Do you have any advice on how you stop the condensation type appearance on glass jars when the soy candles have set? I’m having real problems with this. Thanks. Thanks Liz. Do you mean on the inside like the wax has some bubbles in it? Hi there, love the way you’ve explained and worded this, makes it very simple! This is probably a dumb qs, but is the tape or blue tac or whatever you decide to stick the wick down in the container with, is it safe to use when the candle burns right down? Like does it burn or smoke or anything?? Not a dumb question Gabe. Yes it could I never let it burn down quite that far just in case. I’m sorry to hear that Ronni. What do you mean when you say they don’t burn right? Thanks a lot for the tutorial! It was really good idea to use the bag clips for holding the wicks! Recently I started to use them as well. Hi Annie. The rough rule is about 30ml per 500g. Good luck! I read your tutorial and bought what I needed. However, I was told by a person who made candles for a living that you should never microwave wax, as once it reaches a ‘flash point’ it has a very high chance of catching fire. So I went and bought a large aluminium wax melting pot, that came with a spout which makes it easy to just pour the melted wax into your molds or jars, etc. I’m going to try the sticky tape method of keeping the wicks at the bottom. However, I found this neat thing called ‘Wick Stickums’ which basically stick to the bottom of the wicks with the metal bottoms, so you don’t have to use a hot glue gun, and they stick the wick to the bottom of your jar or glass, cup, etc. What a great idea Shanneene. The wax melting pot sounds like a very good thing too. I will look forward to hearing how you go. Oh that sounds so good Shanneene! I sourced all my materials off eBay. The middle of mine sink even without being placed in the fridge. Mine also don’t burn properly. Could it be the wicks or wax it’s self ? I do put oil in them & also give them colour by adding crayons. Hi Sarah. You do sometimes have to pour more wax if they sink a little but the burning I would say could be the wicks. What sort of wicks did you buy? Sorry they’re not working out for you! Thanks so much for the instructions- Just purchased all that I need for the Natural Candle Supply website that you provided- SO EXCITED! For it to all turn up and give it a go! Hate to think how much I spend on candles- This will certainly help! I struggle daily with migraines so burn a lot of “aromatherapy oils”- I went off my aromatherapy chart in the way of selecting fragrances! CANT WAIT to chill out to some relaxing scents. That’s a great idea to help choose the fragrances. I hope you like them! Hi! What’s the size of the cup of you candles? Thanks for your instructions, I made my first batch of candles today. I made three candles and all 3 have sunk at the top near the wick. I ran out of wax each time (I am a bit impatient when it comes to measuring) so I had to pour then melt more wax (which only took about 3 mins), would this be the reason? Do you pour the wax when it reaches a certain temperature? Yes that seems to be a common problem Sarah. I find you need to let the first pour settle a little and then top it up. I hope that helps. Using those Ikea clips as wick holders is pure genius! I’ve been struggling with icy-pole sticks and clothes pegs to hold the wicks in place, while I had a bag of clips sitting unused in the drawer. Thanks for the tip! You’re very welcome! Isn’t it funny how it’s the simple things we don’t think of? I just read the post from the kindy teacher & it reminded me of an experiment I did in candle making to entertain some kiddies in the school holidays. We were living in a rural area at the time so it meant a significant delay to order products. I used what we had at home or could buy in the supermarket. I used copha instead of wax, grated a small amount of the kids crayons to add colour, empty jam jars, & used some fragrance oils that we had at home or could buy locally. For the wick we used a 3 ply braided cotton string that I found laying around the house & coated it with melted copha & let set. The kids loved it & got creative with fragrances & colours…even coloured layers. All in all an inexpensive fun activity to do with the kiddies. They were really proud of their creations. What a brilliant idea Tracey. I bet they loved it! Good question Tracey! I read that cotton was the best type to use. Hi Claire, just wanted to mention to Irene that I’m currently researching essential oils in soy wax candles and a lot of info says that they don’t recommend essential oils as they can catch on fire very easily? I am interested in making a essential oil candle but currently researching still. Thanks for that Deb! Yes I think you need to use the special candle scents. Hi Claire, thank you so much for posting this recipe! Like yourself, I love the arts and crafts, I am a Kinder teacher and yes there is definitely an art and craft corner in my classroom haha! I have been wanting to get into candle making for a long while now, but hadnt quite found the right recipe to follow. Yours is amazing and exactly what I was looking for, simple, easy to follow and includes photos. I’ve ordered my very first kit and cannot wait to get into it! I just have one question regarding the scents and how much/how many drops go into the mixture? Hi Erin. Yay! Now I can totally imagine the arts and crafts corner. I can’t wait until my little one gets into it. That is a tricky question. It was a bit of trial and error with the scents and it depends how strong you like your candle. I would start with just a couple of drops per 100ml of wax. Sorry I can’t be more specific. Happy candle making! Hi Rachel. Oh I know the feeling not wanting to waste the expensive candles. I would go for the advanced soy wax flakes. Now this is just an estimate but 1kg of flakes should make about 500ml of liquid wax. Happy candle making! tThanks claire!!!! i’ve been doing some reading up on this and some places mentioned that if there is no metal tab and the wick burns to low it can heat the container or the surface it is sitting on. have you experienced any problems with this using sticky tape?? THANKS! Do you have a tip with regards to how to make the flame glow steady without flickering too much. I make soy candles in mason jars or in cups. Hi Jenny. The only thing I can think of is keeping the wick trimmed short. I hope that helps! Hey, about to make some candles for Christmas gifts. How did you work out how much fragrance to add? Is there a formula you used or did you just put a random amount in? Hi Alex. I wish I could tell you a formula but I randomly added just a few drops. Good luck! Thanks heaps :) ill give it a shot & just hope for the best! No problem Alex. Good luck! Once again, I don’t know what im doing wrong. My candles keep setting on fire. Ild like to successfully make them. Also what does “flashpoint” mean? Hi Irene. I’m sorry this keeps happening but I’m not sure why. I haven’t heard of ‘flashpoint’ before. Hi I made a candle a few weeks ago. when I lit it after a couple of minutes it set on fire. Why is that? Ild like to continue making them but only if I find out what ive done wrong. Irene I’m not sure about that. Could it be the type of wick or the scent? Was it special candle scent? what type of soy wax do you use? Hi Jess. If you click through the wax links you can see the one I used. Hope that helps! 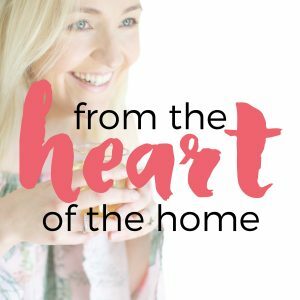 Hi Claire, I found your blog a few months ago now and have been making my candles since then … even getting orders from family and friends!! One thing I’ve come across with some candles, after a little while, they end up with a white ring around the outer edge at top of the vessel. Looks like hardened dry wax but its not as it still feels the same as the rest. Do you have any idea what may cause this? Hi Tammie. So glad you like it! That is really strange. I’m not sure what causes it but I did a bit of a Google and it says something to do with temperature changes. Are you using colours? I’m so sorry about your mum Bec but that’s wonderful that you’re keeping her passion alive. I’m so glad I can help and thanks for the colouring tip! Hi Claire, Love your tutorial and made my first candles last night and now my daughter and I are hooked. /they turned out great and are so easy, we couldn’t believe it. I was wondering if you could tell me where you bought your wick trimmer and a price please? I live in regional Qld so most stuff I have to order online but I can’t seem to find anyone in Aust that sells them. All the ones I have found say they can’t be used on unburnt wicks. Any help would be great. I’ve read your candle making as I’ve just started myself. But we are told to use two different waxes one for jars, candles and one for the moulds? I want to try and find some fragrances to buy? Hi Angela. I just use the one type of wax. If you follow the link in the post you can see where I bought my fragrances. I thought they were very good to buy from. 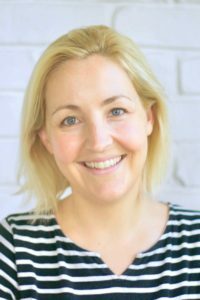 Hi Claire, I’ve just read your post about making soy candles and thought it was great. Like everyone else I love candles too and have made a few in the past and there’s been a lot of trial and error along the way! After a couple of hand surgeries and 3/4 years of not making candles, now that I’ve read your article it’s made me want to give it another go. Whenever I made candles I always made sure that whatever container I was using was warm, not hot, just ‘aired’ if you like. So that the wax isn’t being poured into a cold container, this helps to prevent cracking, shrinking away from the sides and from getting the ‘bloom’ which sometimes forms on the top of the candle. If all else fails, once the wax is fully set, then a second-pour usually sorts out any slight imperfections. Using wax left over from the batch you made, re-melt and very gently pour a small layer on top of the candle to fill in any cracks or cover any ‘bloom.’ Ensuring that the wax is melted to the correct temperature of course so that it adheres to the already set wax. Temperature is very important, correct melt temp and pour temp. And being soy wax everything you use, utensils, pans, jugs, jars, votives, etc., etc., everything is completely washable, as are any spillages. Hot, soapy water and it’s all washed away, wonderful. Much better than paraffin wax or bees wax, although bees wax makes such nice candles too. I like the sheets which are so easy to roll. I think your idea of using sticky tape to fix the wick to the bottom of the container is brilliant Claire. 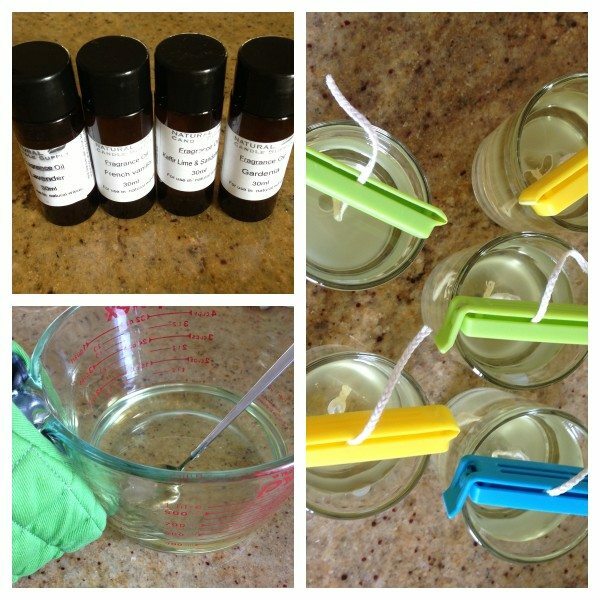 I used wick sustainers, but they won’t be necessary using your method – great tip! Now I need to find some natural candle fragrance oils here in the UK as I’d been using pure essential oils in the past. I don’t like the artificial fragrances :-( It’s autumn here, so what better time than now to start making candles and have them burning throughout the house to make the place cheery!! Hi Violet. Thanks so much for the temp tips! Very handy to know. Yes that’s great that you can wash it all up. I had a nightmare time when I used paraffin wax. I hope you find the fragrances. Thanks for such a great comment. Good luck Alison! I’m sure they will be perfect. 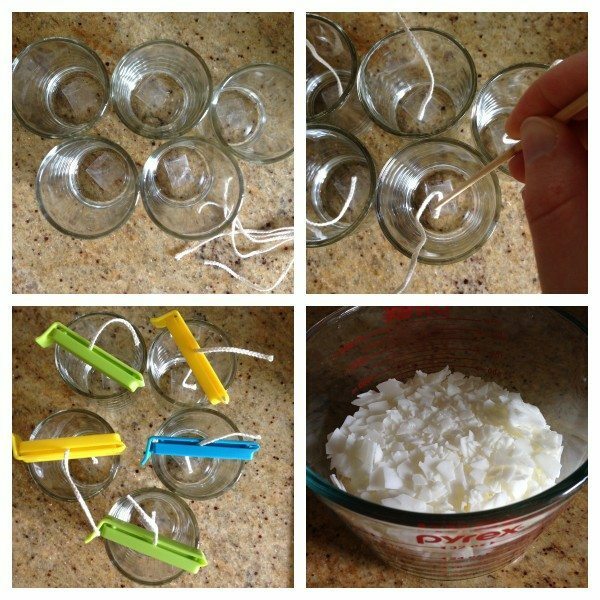 Thanks so much for sharing this candle making post, I have made some Coconut & Lime candles and it was so easy! You’re welcome Madeleine! That sounds like a lovely combo. That would be hard Kedyma. I hope you can find the right supplies! Wendy I did have that problem with a few. Superglue works well but don’t use a hot glue gun like I did. The glue melted when I put the wax in! Hi Wendy, You could try blu-tack (the white version! ), I’ve found this works extremely well and is really easy to remove afterwards if you’re re-using the container. 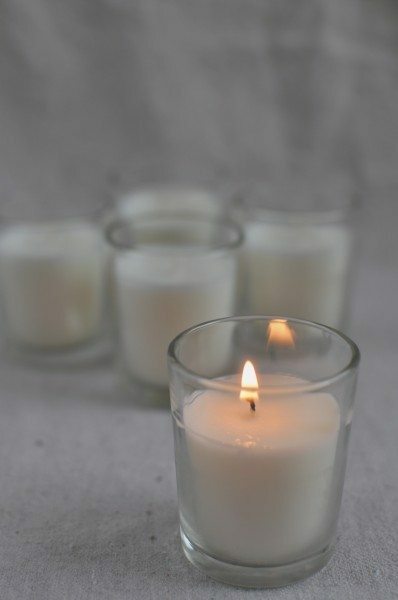 Nice post and the information in the blog is really useful and I will definitely look toward the experiment of soy wax candles. You sure can Suzanne! Maybe hunt around for the stuff that’s inexpensive for your first go then when you’re a pro buy the more expensive stuff? Hi Hannah. From memory mine came with just a big piece of wick and it was about 2cm thick. Hope that helps! I really enjoyed reading about your candle making foray followed by the comments section. I live in Arizona and found the following site has an extensive “how to” section that you might find useful. It covers questions regarding different types of waxes/soy, dyes, scents, containers, other basic supplies and safety precautions. I can’t wait to get started. Find High Quality Candle Supplies. Thanks Dianne. I’ll have a look. I definitely need some more tips! Hi Joan. I’m very sorry but I don’t know what could be the cause of that! Hi Suzanne. Ooh that sounds delish! I haven’t heard of that product sorry. With the amount, it depends on what sizw candle you’re making. The wax should include instructions for that. With the one I used, you needed 2 cups wax for one cup. Hi Claire, Love your candles! I am a candle-making newbie and have been getting condensation on the inside of my glass containers when using either soy or paraffin wax. I have tried warming the containers before I fill them but nothing seems to make any difference. Can you tell me what I am doing wrong please? Many thanks. Hi Sue. I’m sorry I’m not too sure about that one. The only thing I can think of is maybe the temp of your kitchen? I would say if it’s too cold that might cause condensation? Hi Tania. Hmm I’m not sure. I would say that any glass jar is fine. Ceramics it probably depends on the type. If it’s oven-safe I’d say then it’s fine. Thanks for this, Claire! I followed this tutorial to make soy candles today for my blog, but I put them into teacups. So good and easy to understand! And they smell soooo delicious. You are the candle master. Thanks Kirsten! I’m glad you liked them and great idea using tea cups! Wow Claire I love your post! 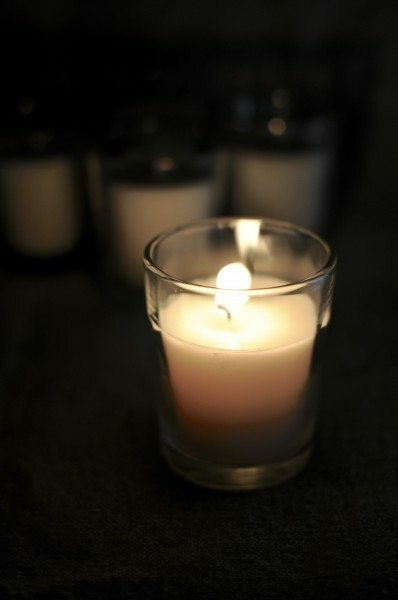 I have often thought about making candles, especially soy candles as they are beautiful to look at and smell. We had a black out recently and my soy candle supply has now diminished. With your easy instructions I will get some supplies and have a go (French Vanilla is my favourite too). Have you tried making citronella candles yet? Thanks Merryn I’m glad I could help! No I haven’t but that would be great. Can you use bees wax..instead of soy? I’m not sure Renee, I’ve never done it. Do you have any tips if I don’t have a microwave? You could melt the wax using a double boiler on the stove. Great idea melting the wax in the microwave! I just got some candle making supplies from a friend and here I was about to try to find pots to melt the wax in on the stove. I will be trying the microwave method instead tomorrow! Hi. I’m also just getting into candle making and have been experimenting over the last few weeks. I’m yet to get a decent scent throw, however, I have just been using fragrance oils that I use for my burners. Maybe that’s the problem? In regards to colouring the wax, I tried food colouring and it does not work that well. I got quite a lot of colour bleeding and it looked terrible. Ive experimented with crayons and that turned out ok.
Hi Tracey. Hmm that could be it. Great idea with the crayons! I’d like to make some soy candles for my wedding, which is in three weeks. I read on another blog that you can’t use the candles for two weeks after making them. Is this your experience as well? Hi Rachel. I’ve not heard that. I know it’s best to leave them at least 24 hours but I’ve used mine before 2 weeks. Happy nearly wedding day!!! Your candles look delicate enough to eat :) May I ask how long the candles burn for and are the fragrances/oils used phthalate free? Also are the wicks cotton? Sorry for all the questions but it gave me a great idea. Hi Laura. Sorry I’m not sure about any of that except yes the wicks I used were cotton. Great page Claire, thank you. Bought some soy flakes ages ago- didn’t come with any instructions!? Going to attempt some Clary sage scented ones this afternoon!! You’re welcome Faye! Good luck! I want to use wild crafted organic essential oils. What would be wrong with that? I don’t want to get a pre made fragrance. Can someone speak to that? Hi SJM. I’m sorry but I don’t know enough about them to give any tips. Essential oils are fine to use just start at 6% as some may ‘upset’ your wax. Thanks for writing this post, I’m really looking forward to giving it ago! 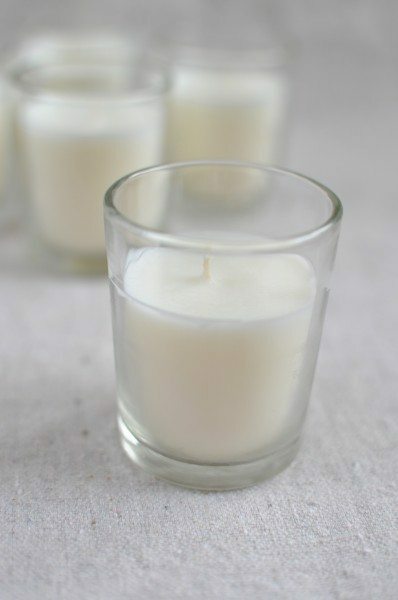 Just wondering if you or anyone knows where I can buy soy wax and other candle making bits and pieces from in QLD, Brisbane or around brisbane south or north? I had to pay postage, however. Love your post! How much fragrance oil does one need to use for a candle? What’s the formula for the amount we need? Also, where does one buy wax flakes? As to the formula… it’s a bit of a trial and error really because it depends how strong you want it. I added a few drops to my mixture. Have you added any colouring to the candles? Would you just use food dye? I haven’t added colour before I’m sorry. I assume food dye would work. Hi, great article – thank you! Just wanted to add a note that I am sure I read recently that food dye is not suitable for candle making. I have no experience with this myself but I am sure I remember reading that you need a different kind of colouring for it to work well. Thanks for that John! I will have to do some research into the colours. I haven’t done it but been told to add crayons in the melting process to colour, food dye is water based so it wont mix with the wax. Very interesting Jay. I’d love to hear how it turns out if you try it. Hi we have made some in tea cups but the wax has slightly come away from the sides of the cups. Any ideas what we did wrong. Hi Joanne. Sometimes as it sets it shrinks a little and you can have to top it up a little. I think it happens if it cools to quickly. How much of the fragrance oil did you use ?? Hi Andrea. It really depends how strong a scent you want and what fragrance you are adding. I just used a couple of drops for mine. Thanks so much for posting this, it’s so simple to follow! Quick question – do you know a cheap place to buy the wicks and wax flakes from? I just want a small/cheap amount to start with to make sure I can actually do it haha! I just bought a small bag of soy wax, wicks, and scent at Hobby Lobby. I paid $12.00 for all (I used my phone coupon). I’ll have to look there next time Christine. Thanks for the tip. Wonderful easy explanation, i think Im going to give it a go . 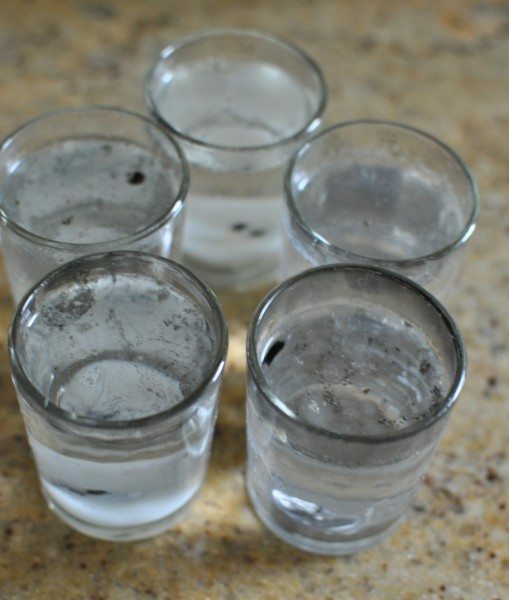 Great tip for cleaning the glass votives, thank you! Ooh lovely thanks Hodge Podge! Hi I have just had a little lesson with a friend on making soy candles and she went to a class. They told her to add 10percent qty of fragrance per candle. So 400gm candle add 40ml. My house smells fab and the oil came from a candle supply place. French pear, oh it’s smells amazing and for the few dollars of cost for the fragrance it’s well worth it. The 400gm candle retails for $30.00 Aussie and cost less than $5.00 I am very happy. Thanks for the tip Stacey. Isn’t it crazy how inexpensively you can make them compared to the price in the shops?! How much oil do u use per candle? Hi Jackie. That’s a good question.. I just used a few drops in the jug which had 2 cups of melted wax. I just made two candles in containers that had candles before. It only took me about 20 minutes using the microwave. I used newspaper to lay my tools on, so there was no surface cleanup. I wiped out my Pyrex cup and the metal spoon I used with paper towels, and stuck them in the dishwasher. This is incredibly easy. A question: I used about a tablespoon of candle scent in my candles, about 8 oz each, and they don’t seem to be that scented. Do these candles really smell when they burn or is it barely noticeable? I want it to be able to tell when they burn. I think it depends on the type of scent. The one I used was pretty strong and I could smell it well. 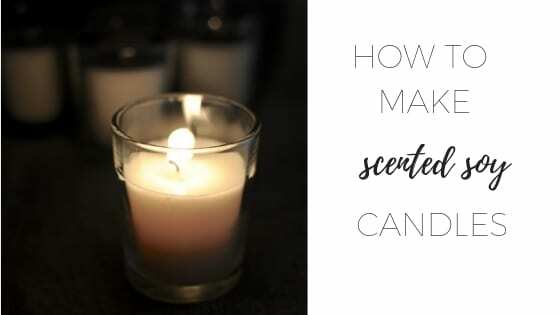 Are you using special candle scent? This is great, thanks for the instructions! I just spent a small fortune on candle making stuff! Just wondering if I wanted to add colour would I add it when I add the scent? Have u tried to add colour? How did it turn out? Hi Sarah. I haven’t yet. That will have to be my next challenge. Can’t wait to try making soy candles! Suggestions about types of oils to use and types to avoid and why or why not? And, how much oil do you add? Thank you! Hi Jen. I’m not 100% sure. I usually just add a couple of drops. I bought my oils from here http://www.naturalcandlesupply.com.au/#Candle-Making. It’s best to buy the ones that are made for candles. As far as what to avoid etc… depends what you’re after. I was making one for a pregnant friend so did some googling to find out which oils weren’t good for the bub. Lavender is safe! I’m so excited to try this! I had no idea it was so easy – these look beautiful and I bet they smell amazing. Look forward to seeing yours Stephanie! Yay Jen! They’re really easy to make, you’ll love it! I’m candle crazy! My favourite is by Tuberose Rouge by Diptyque! You did a great job-what is your favourite scent Claire? That sounds rather fancy Lorraine! I’m not sure which is my favourite yet but I do love classic vanilla. YAY! Welcome to the soy candle-making bandwagon. You will now be addicted forever – I speak from experience. Isn’t it shocking how much those things cost when they’re so easy to make!? I’m so glad you shared this, because I didn’t know the tip about how to clean old jars – I’ll give this a try next time. Yep you can recycle all the ones you finish with! So crazy and I can’t stop they’re just so much fun to make! I love that they don’t really look homemade either. and tell me what do u think about refilling these beauties ? You’re very welcome. I’m not 100% sure on these. You would need to find the special wick but I couldn’t find anything from a quick Google. They look amazing though! Sorry I can’t be more help. Hi, I’m new to the homemade scented candle business and I have a budding question, please pardon me if this question has been asked and answered before. Can someone please tell me which is better for scented candles Tin or Glass Jars??? does any affect the way the fragrance is released or the intensity of the fragrance??? I look forward to your responses. Hi Ken. I would be more inclined to use glass. Hi! I recently found a brand new 4 pound box of soy flakes at a local goodwill store for $1.99. I never made candles before but couldn’t pass up a bargain!! I used this site for instructions & bought several really cool small distressed tin containers from Michael’s, on sale of course!! The candles are beautiful & the little tins worked out perfectly for candles, no leaks or any problems at all. I’m inclined to take a risk, if I think something I like might work. Hope this helps with your question about tin containers. What a bargain Brenda! That’s awesome and you’re very welcome.